If you are looking for a washing machine that is heavy on both performance and capacity, then you should seriously consider the Kenmore Elite White Oasis™ HT High-Efficiency Top-Load Washing Machine (2809) ENERGY STAR®. With a load capacity of 4.6 cu. ft., it can easily wash loads of laundry that would usually take three rounds in an ordinary washer. It is also equipped with the ClearView™ Glass Lid, which allows the user to check the status of washing clothes without having to open the lid and therefore interrupting the wash cycle. The washer is equipped with a Stain Treat option with built-in heater that can clean even the most stubborn stains in a load of heavy articles. The washer's tub has a 4.6 cubic feet capacity which allows for more laundry to be washed at once. This washer is equipped with Gentlewash™ technology with Invizible™ agitator, which means clothes and other laundry are cleaned more thoroughly. The washer's mechanism is certified by the NSF® to wipe out 99.9% of bacteria. It is also equipped with the Timed Oxi™ option which releases oxygen-based stain fighters during a wash cycle. 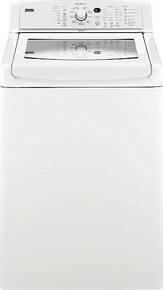 The washer has a classic look with its sleek white exterior. It is equipped with the Clearview Glass Lid, which allows you to see what's happening inside the machine while it cleans your clothes. Total Volume: 4.6 cu. ft.
As loads of laundry can be washed all at once, it saves money on utility bills. Moreover, it has efficiency qualifications that exceed the ENERGY STAR® implemented by the government. Articles cleaned with this washer are free of allergens as Heavy Duty and Whitest White cycles eliminate more than 95% of household allergens. It is a high efficiency washer that allows savings of up to 69 percent water and 66 percent energy, plus an additional 20 percent more savings in energy if the Save Energy Plus option is used. The washer has a number of wash cycles depending of what kind of load you will be putting in, making sure that laundry is clean when the machine is finished washing them. Codes come up in the display screen indicating possible damage which disrupts washing. Once the machine breaks down, repairing it could be very costly.